NEW YORK - Nov. 6, 2018 - PRLog -- The Internet has gone wrong! We have fake news, problems with privacy, and people being profiled and manipulated. We have to put the Tech firms on the defensive for unfair profiteering and harvesting data on consumers' browsing habits. Heard this before? Trends in technology and cybersecurity are moving fast, and to stay informed, blurb blast has got YOU covered. Why spend all day surfing? 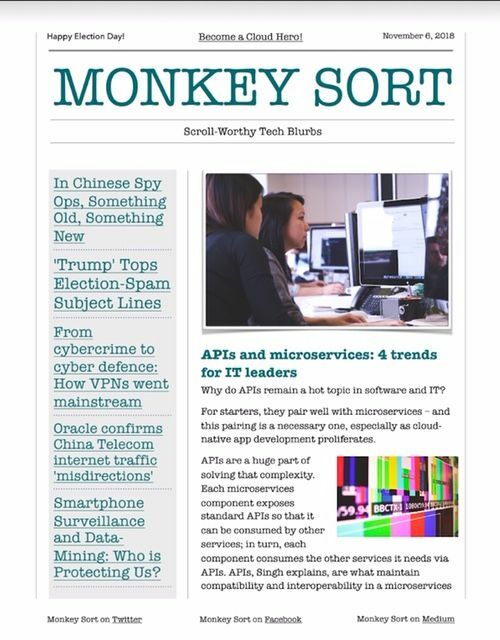 blurb blast curates, parses and presents the latest Tech, Digital, Security, Cloud, Code, Big Data, Internet, Hacker, Software, Crypto, BlockChain, and Gaming headlines via real-time feeds, and also publishes "The Monkey Sort", a daily, downloadable newsletter. • Smartphone Surveillance and Data-Mining: Who is Protecting Us? These blurbs and dozens more are blasted every day on blurb blast so click over to https://twitter.com/BlurbBlast, Facebook, Medium or download today's issue of The Monkey Sort to catch up with all of today's hot Tech News.